Taken over by Mondomarine in 2015 a new journey is awaiting one of the most important custom yacht and super yachts builder from Italy, the legendary Cantieri di Pisa. The new owners have been fast going into buisness of things and after presenting the project of the 22 Kitalpha went a few months later to announce a new Akir 42 S. For this three deck and half super yacht Cantieri di Pisa will use designer Luca Dini. Previously the yard has been working with Galeazzi and before that it was the architect that was Pier Luigi Spadolini who gave the new direction with the Akhir series. Hull one of the Akhir 42S is under construction and will be build with light alloy to the best Classification standards. 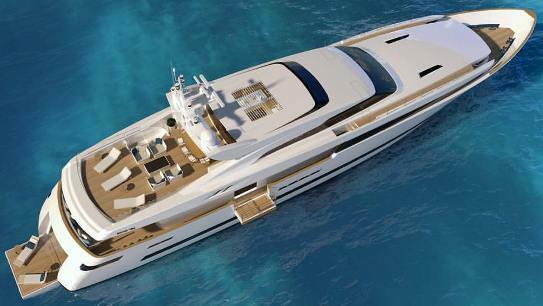 Power for the Cantieri di Pisa 42S Akhir will come from twin MTU 2600hp engines giving estimated top speeds up to 23 knots.